WHEN Yorkshire returned for pre-season training last November, Andrew Gale gathered together a group of his senior players. Yorkshire captain Andrew Gale, right, with top wicket-taker for the County Championship season, Jack Brooks. Yorkshire in 2002. Nottinghamshire in 2006. Lancashire in 2012. All had gone down one year after winning domestic cricket’s greatest prize. In 2011, Gale’s own team had been relegated one year after so nearly winning the title on the final day of the previous campaign. It convinced him of the need to address the subject. “The first thing I did when we came back in for training was to get five or six senior players together and say, ‘Right, what do we need to do to carry on being successful?’” said Gale. “There’s a history of teams winning trophies and getting relegated the year after, or fighting relegation, and I didn’t want that to happen to us. “The conclusion that we all came to was to make a conscious effort to be very particular about our standards, and to make sure that our standards didn’t slip. Gale said one of the biggest influences on discussions was Ryan Sidebottom. The pace bowler had played in the Notts side that suffered relegation in 2006. “Siddy was a big driver,” said Gale. “He played in a side that was relegated by mid-August, one year after winning the title, even though they had some stars in their line-up. “After that chat with the senior players, I just knew that everyone had the bit between their teeth. Gale’s words support something often mentioned by first team coach Jason Gillespie in media interviews. Gillespie speaks often of the players driving standards – as opposed to the coaching staff telling them what to do. “At the end of the 2014 season, there was a lot of talk in the dressing room among the players that they didn’t want the title to be a one-off, and that they’d love to back it up,” commented Gillespie. “It’s easy to say that, but to then actually back it up through their actions is very special. “At the end of the day, it all comes from the players. While Gillespie and the coaches encourage that philosophy, Gale helps drive it home on the field. It is difficult to think Yorkshire have ever had a more determined captain than the man who has led them to back-to-back titles. Gale’s pride in his players is fully justified, but he also believes there is room for improvement. If Yorkshire win the title next year, it would be the first hat-trick by any county since Yorkshire themselves between 1966-1968. “I definitely think we can still improve,” said Gale. “You look at the batting at times and we’ve not quite nailed it. “Although we’ve got decent scores, it’s been down to one or two individuals and we’ve relied on six, seven and eight a lot this season. 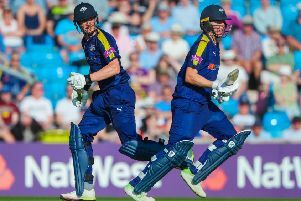 “Last season, we had a massive opening partnership regularly and a lot of guys averaging between 40 and 50 for the season. “Jonny Bairstow pulled us out of the proverbial quite a few times this year, so there are definitely areas we can improve on. “We blew a lot of teams away in 2014, whereas this year we haven’t done that as much. “We’ve had periods where we’ve been behind the eight-ball but we’ve somehow found a way. Gale is right to highlight Bairstow’s contribution, which has been remarkable this year, while he is blessed with a brilliant bowling attack. The core group of seamers – Ryan Sidebottom, Jack Brooks, Steve Patterson and Tim Bresnan – has been excellent, with Liam Plunkett and spinner Adil Rashid adding to that quality when not required by their country. “You’re always going to stand a chance of winning games if you can take 20 wickets, and our bowling attack, without a doubt, is the best in the country,” said Gale. “Every time we walk out on the field they create the pressure to take 20 wickets, and even when people have produced flat pitches against us, we’ve got round that. Yorkshire’s second successive Championship has been extra special for Gale, who was denied the chance to lift the trophy last season as he was serving a suspension. Gale was banned by the England and Wales Cricket Board after a verbal altercation with Lancashire’s Ashwell Prince during the Roses match, and the decision of the governing body to prevent him from lifting the trophy at Trent Bridge was condemned throughout the cricketing community. “I’ve represented Yorkshire since I was 10 years old, and to come right through the ranks and then be told last year that I couldn’t lift the trophy was very hard,” said Gale, for whom the debacle provided extra motivation. “A lot of people don’t win a Championship in their career, so to be given another opportunity is wonderful.